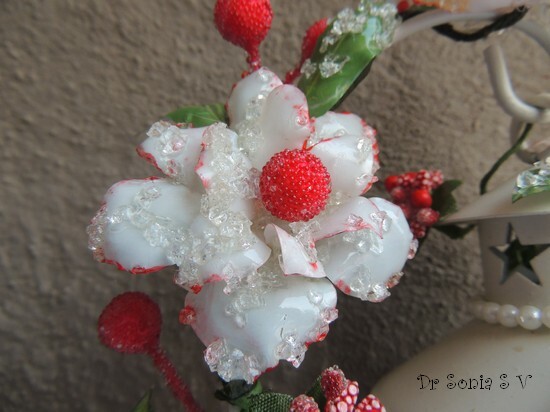 Crafters Corner : Challenge # 15 - GO 3D……. Challenge # 15 - GO 3D……. 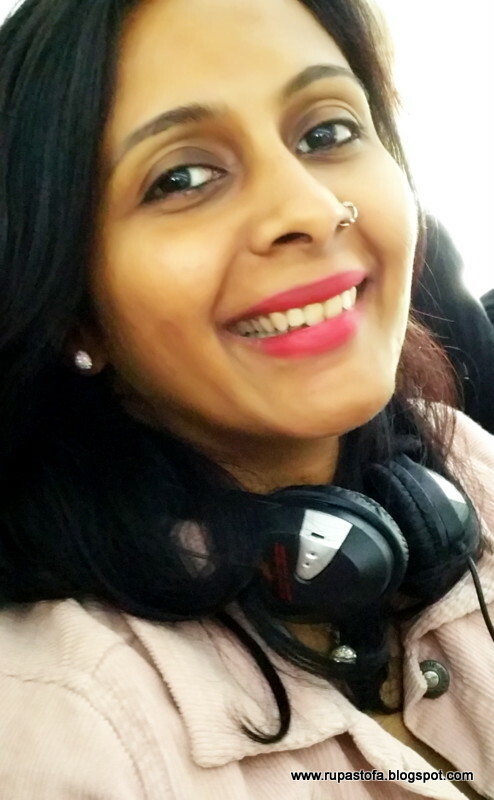 I am quite thrilled to host the first challenge for the year 2014 and want to thank all of you for the patience and eagerness you have shown for our blog challenges! We had to go for a break in between but now we are back with a BANG! 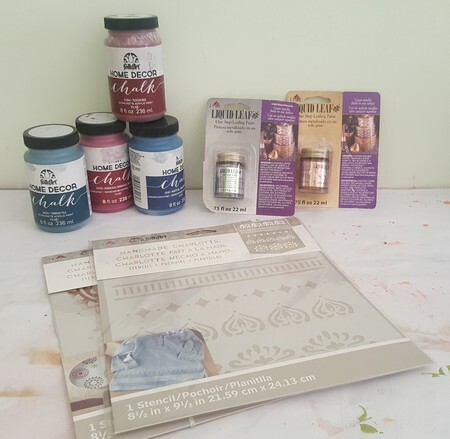 At this point I would like to introduce and welcome the DT members for the blog. To start with we have the very talented Riti Banka Poddar from Kolkata, amazingly creative Anchal Sapra from Chandigarh, The CAS queen Sindhu from Hyderabad , our very own glitter diva Tejal Shah from Ahmedabad, and me Arjita Sepaha Singh from Bhopal. With so many talented people together I am sure creativity will be at its best and we all will learn and gain perfection. We will be sharing all what we know through tutorials ,posts and videos. Looking forward for some amazing projects from all of you here. You are expected to make a 3D project eg. 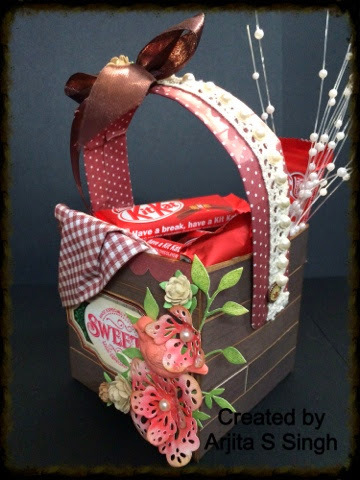 a box, bag, basket,etc which has the real 3D feel in it for any occasion and any use. Please take note that we will not accept any fancy fold cards,easel cards and stepper cards and Albums for this challenge. The 3D element has to be created by you and should not be a ready made thing or reused product. So all u guys plan and GO 3D!!! 1.You can enter in this challenge upto three times only. 2.You need to be a follower of our blog. 5.Please abide by the details given in the challenge. Now the most exciting things....!! 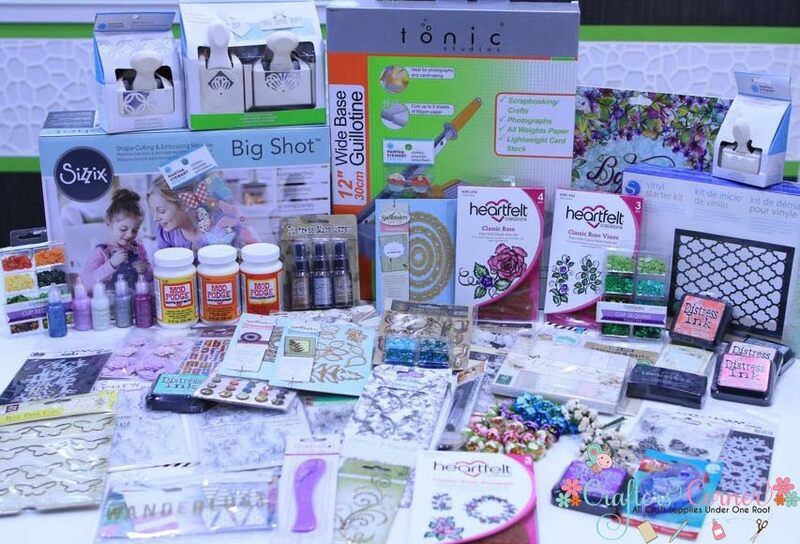 Crafters Corner always encourages all the participants with the most amazing prizes. 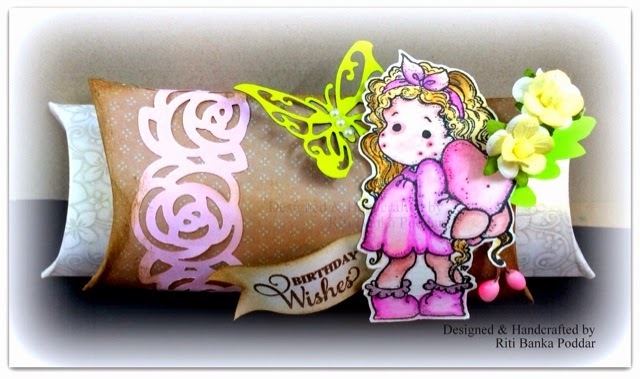 For this Challenge this pretty Justrite Background Stamp can be yours…. We will also have a random winner who will be eligible for a Gift Voucher worth Rs 500/-. 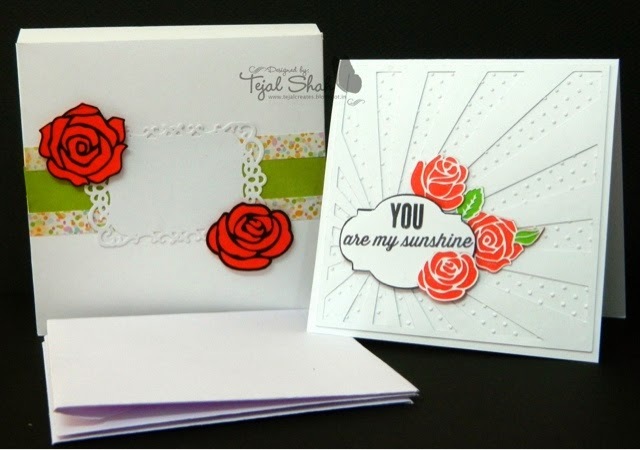 The DT Members have essentially used the latest Punch Boards by We R Memory Keepers in all their gorgeous 3D projects that I am gonna showcase today….. So sit back and give a treat to your eyes by going through the projects and get inspired to design your own and send it to us before 29th April. Riti has created this adorable pillow box duo which she has joined together with this pretty rose border. Excellent colour choice and with the hint of a neon butterfly everything looks so stylish and chic. 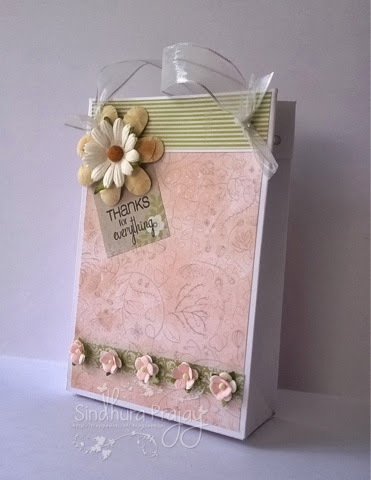 Our next inspiration is by Sindhu who created this beautiful bag and embellished it in her own style with these pretty flowers . We all admire her unique style .... I loved the choice of pattern papers and the ribbon looks just fab!!! 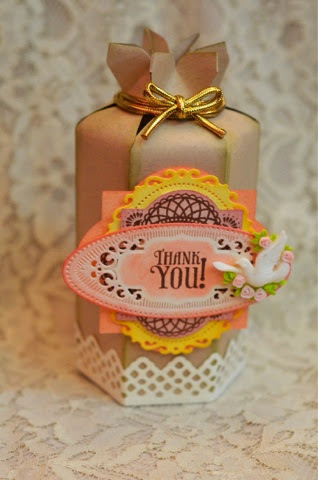 Anchal designed this awesome jar which can hold many things and will be a perfect gift for anyone. 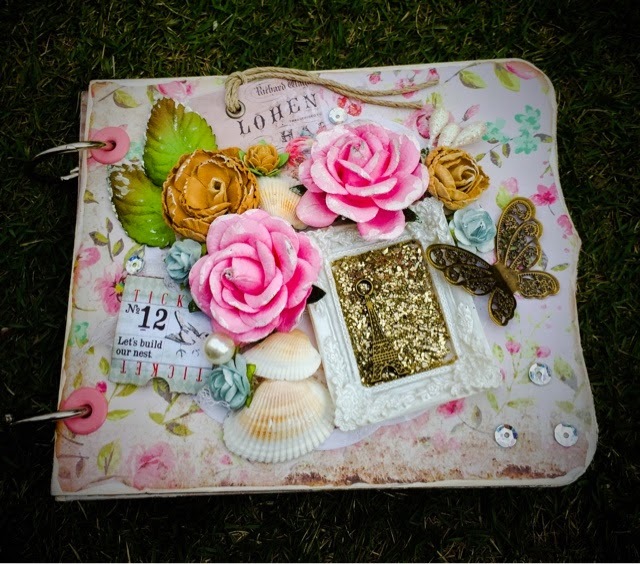 I loved the choice of dies and the gold ribbon which makes it so attractive. 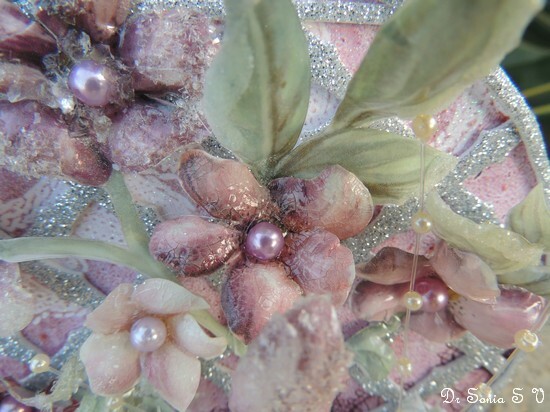 Look at the petty resin dove and the beautifully stacked layers which makes it a masterpiece. 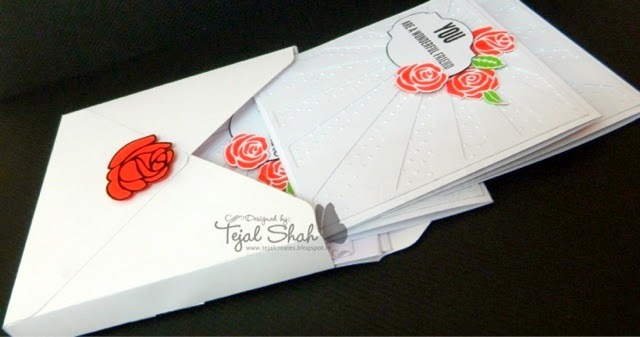 What to say about this gorgeous project by Tejal.The cards, envelopes and box she created are an absolute treat for eyes. The striking red and white looks so royal....loved it! A perfect little gift to anyone close to your heart. 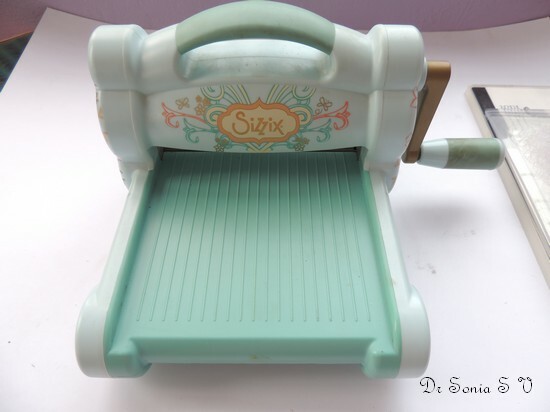 All the gadgets and products just become mere toys when it comes to her designing... Hats off to u !!!! 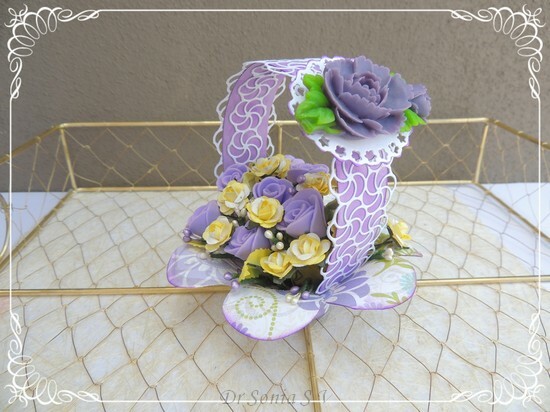 I made this basket which I covered with wooden print paper planks and embellished with few flowers and leaves. 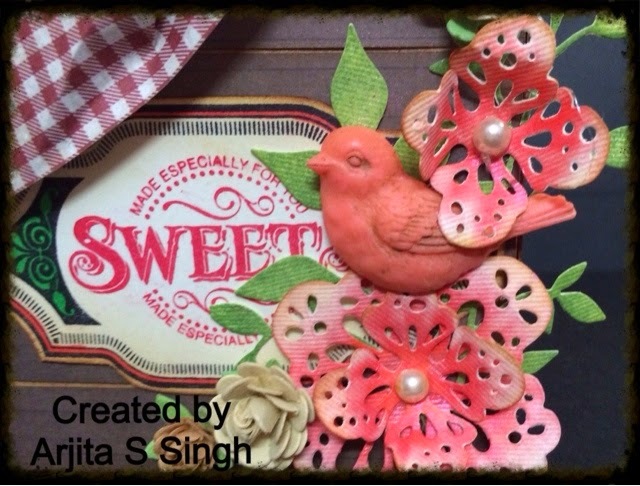 a nice way to present hand made chocolates or Mithai to our near and dear ones…. 6. Brads, ribbon and lace from stash. Amazing job done by your lovely DT's!!! Thank you for the lovely inspiration. Wow!!! Fabulous projects by everyone!! Fab projects! Total eye candy! Just one question - does the project have to be paper or any other material, like clay or fabric, is OK? OMG what a fabulous inspiration from all the DT"s, loved each and everyone's work :) What a total fun challenge as well :) ..Really looking forward to playing along this month ! Wonderful inspirations from the DTs !! Stunning inspirations...All of em just too good !!! 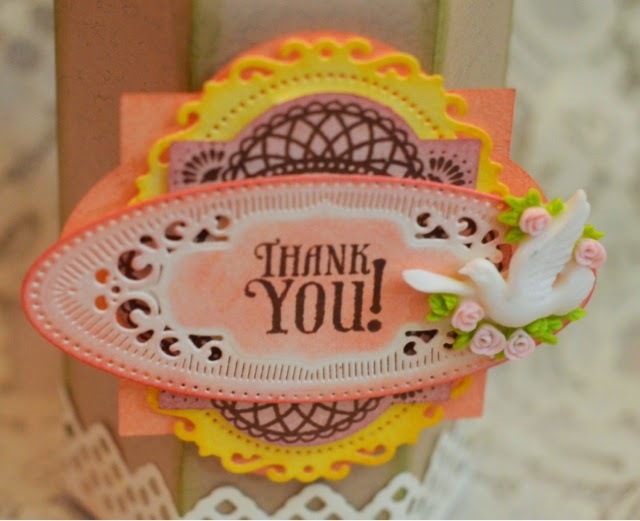 Thank you Shalini for resuming the Crafters Corner blog. Have waited a long time to see all the DT's in action with their fabulous creations. A big congratulations to all the new DT members. Yay.New challenge.It will be fun to be a participant.Great inspiration from the team. How can I send my entry for the challenge? 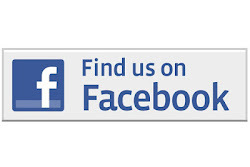 All u need to do is link your project by clicking in the blue button at the end of the post. Thank you all for all the appreciation !! 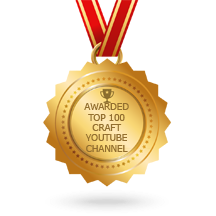 Please keep your fabulous projects coming in !! I'm glad you are back :) Thaks for this challenge :) Was very inspiring and all the DT works are amazing!! Glad that you are back. nice challenge. all the inspiration from Dt are beautiful. die cut, stencil and mask!